Recently while watching Mahesh Babu–Sukumar’s 1-Nenokkadine I experienced a moment where I felt that the director had let go off a lovely opportunity to make the audience, especially the fans of Mahesh Babu happy. If you’ve seen the movie you’d recollect that I’m referring to the climax portion where there is a lot of time devoted to Mahesh Babu trying to discover his old home and in the process remember his past. While we get to see and find out who his parents were, I thought it would have been wonderful to have Mahesh Babu himself and Namrata Shirodkar playing the parents. This I thought would have pretty innovative, considering the amount of time being devoted to this segment in the movie. Alas but that was not to be and we couldn’t get to face what could have been an interesting moment in an otherwise grandiose attempt but with its pitfalls galore. Now why am I talking of 1-Nenokkadine now when this is supposed to be the review of Vikram Kumar’s Manam (Us)?? Well don’t worry neither have I lost my mind and nor have you come to the wrong destination, I will explain all that in a while. But before that let’s look at what cinema means to all of us. Are we having a single minded approach when it comes to films as in do we use a one size fits all approach or do our expectations vary as per the nature of the film, the people associated etc? When we were all kids and we started dreaming all kinds of stuff, wouldn’t we let our minds loose and in turn have our imaginations run wild? Wouldn’t we look at comics, books, T.V shows and films as a way of escapism? So have we let that side of ours die a natural death? Or do we still surrender ourselves to the charms of the fantasy World that books and films can still take us to? 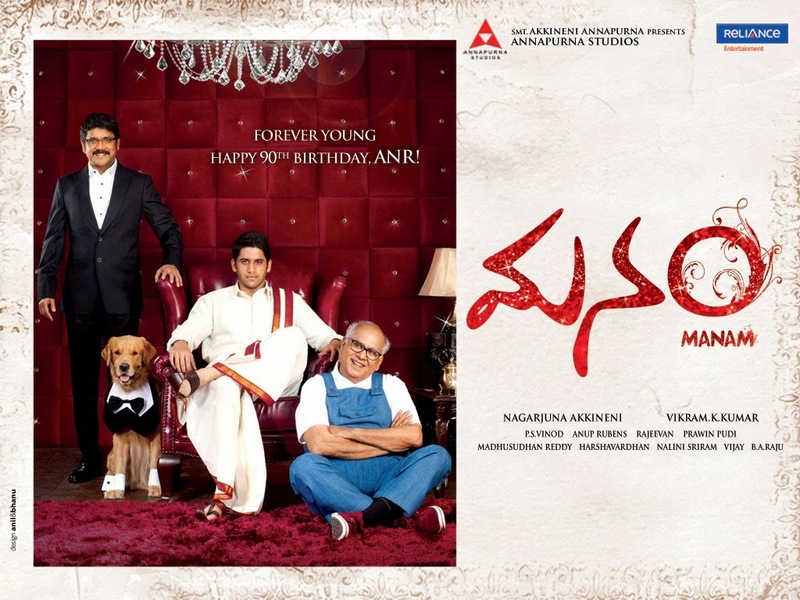 When Vikram Kumar, the director of films like 13B/Yaavarum Nalam (Hindi/Tamil), Alai (Tamil), Ishtam and Ishq (both in Telugu) decided to take upon the mantle of doing a film with ANR, Nagarjuna and Naga Chaitanya, in a rare attempt to chronicle 3 generations of a real family on screen, I knew that it was a risky decision, but something that can work wonders for himself if only he could pull it off. After all one doesn’t really get such a chance easily in life and to let go off it would be nothing less than sacrilege. But an assignment like this brings with it a lot many challenges, ranging from doing justice to all 3 actors, keeping the respective fans happy and weaving in a plot that is conducive and that can do justice to the concept of having 3 generations of actors from the same family in a film. Hence when Manam was announced I was hoping that Vikram Kumar pulls it off somehow considering that I really enjoyed his last 2 films, 13B/Yaavarum Nalam and Ishq. Also this was a rare case of getting to watch a film of this kind, the one other similar film that comes to my mind being Kal Aaj Aur Kal (1971) directed by Randhir Kapoor and featuring himself, his father Raj Kapoor and his grandfather Prithviraj Kapoor. Adding to all the pressure was the fact that the legendary ANR passed away before the release and hence the film by default became ANR’s last project. So keeping all this in mind what has Vikram Kumar come up with? Would it fulfil expectations and deliver to promise? Would this be a redeeming film for the Telugu film industry this year? All these and more were the questions on my mind when the film released. Being out of town I couldn’t watch the film during the 1st weekend as I normally do. But all the reports pouring in were impressive and thus I finally managed to watch the film on a weekday evening. The plot by itself is way too simple or incredibly complicated, depending on how one looks at it. Bittu is a 6 year old boy who is doted upon by his parents, Radha (Naga Chaitanya) and Krishna (Samantha). The year is 1983 and while Radha and Krishna had a wonderful married life earlier on, they now seem to be having a lot of problems between themselves. On one ill-fated day they die in a road accident leaving Bittu all alone. 30 years later Bittu now is Nageshwar Rao (Nagarjuna), India’s leading businessman and he happens to come across look-alikes of his parents, whom he believes are none other than his own parents reborn. So what he does from thereon and how his life get interlinked with that of college students Nagarjuna (Naga Chaitanya again)and Priya (Samantha again) is what the rest of the film is all about. The film is basically about ANR, Nagarjuna, Naga Chaitanya and the 2 ladies Shriya Saran and Samantha and the cosmic/karmic connection that binds them all through 3 generations. Now at the very surface it is easy to make out that the plot is highly illogical, one doesn’t need to be a genius to pick up loopholes with the premise or the proceedings. But then again it’s the very same illogical plot which actually makes one connect to the proceedings and makes one feel a part of this journey over 3 generations. Vikram Kumar’s screenplay has enough sparks to keep you going right till the end of the movie and Harshavardhan’s dialogues compliment the film. Special credit to the “I Love You- Ila Ivvu” portion, which is wonderfully done.The film is strewn with some wonderful moments, Nagarjuna and Naga Chaitanya’s flight scene, Naga Chaitanya and Samantha’s blow hot-blow cold relationship, the entire track in the village where Nagarjuna and Shriya in their earlier avatars meet for the first time, the bar scene where ANR, Nag and Chaitanya indulge in some light banter etc. The way Nagarjuna is named Nageshwar, ANR is named Chaitanya and Naga Chaitanya is named Nagarjuna is innovative and goes in sync with the basic plot. And while the film is certainly a fantasy tale, it doesn’t look outrageous in an attempt to pass off as one. There is a reasonably good amount of detailing that has gone into getting the specific time period look genuine. For the early 1980’s what we get to see is cars driven during that time, simple old telephones, and offices filled with files and typical old furniture rather than computers and designer stuff. The costumes (good work by Nalini Sriram) are also simple and elegant, not the flashy and loud stuff that one usually resorts to in the attempt to pass of the retro look. The 1920’s are characterized by vintage cars, old mansions and typical rural settings which are hardly seen these days. In sharp contrast to these settings we have the contemporary period being denoted by malls, coffee shops, swanky airport lounges, salsa classes etc. This makes the film look visually pleasing and credit for the same goes to the DOP, P.S.Vinod and Rajeevan, the art director who have done their parts with total dedication. ANR shines in a role which sees him play it with finesse, reminding us once again of his legendary status. Vikram Kumar has done well in managing to get a convincing portrayal from Naga Chaitanya in both the characters and he does look convincing both as a married executive in the early 1980’s and a contemporary fun loving college student. Shriya Saran looks gorgeous in both the avtars and once again reminds us that here is a talent who can do with more such films. Samantha is a live wire and performs as expected. But the real star of the film is Nagarjuna who excels both as the businessman Nageshwar and as the zamindar Seetharamudu. Not only does he look charming but there’s a certain innocence that he carries off with elan. This is the kind of film that we expect out of him unlike some of the wrong choices he’s made in the recent past. Vikram Kumar also has done well in connecting the 3 segments wonderfully and makes use of certain elements which bring in consistency to the plot. Notice the use of the winding spiral staircase or the way Shriya falls on Nagarjuna in both their segments for example. The one issue that I have with the film is the way it slightly uses a tad too convenient way in bringing in the culmination. But thankfully it is devoid of unwanted drama and also serves as a good way to show case Akkineni Akhil before the audience. Eventually it is a credit worthy effort from Vikram Kumar who has not buckled under pressure at all and delivered a feel good family entertainer that works on multiple levels. The film is a sort of desi Back to the Future, without all the jazz and gadgets involved and what Vipul Shah failed to achieve with Action Replayy has been wonderfully achieved by Vikram Kumar. This is why I said Sukumar missed an opportunity to probably create some ripples with the climax of 1-Nenokkadine, when he had the opportunity to do so. Manam works beautifully as a fantasy film and one doesn’t need to go by logic to enjoy a fantasy film right? So if you want to question the logic then do yourself a favour and skip the film. Suspension of disbelief is the key to enjoying a film like Manam, and if you can do this then it becomes a pleasant movie for the whole family. Godavari: A Sublime Journey of Life, Love and All That! Lovely review. I seldom get pleased by a Telugu film but ‘Manam’ bowled me over, literally. I loved how Vikram did justice to all actors from the Akkineni clan, without having to give more importance to any one of them. I felt the film could’ve been a little shorter but it still doesn’t bore you. Yes Hari its been ages since I really enjoyed a Telugu film as thoroughly as this one. to the Akkineni clan. Overall a wonderful feel good family entertainer.